Welcome to a Skvalborg-BBQ in our garden! Isn’t there a surprising chill in the air, even by Valborg standards? In fact there is, cause now the time has come for the cold war, or at least COLD WAR-BORG! At Kalmar, east will meet west this Valborg as we start of the celebrations with a no holds barred American BBQ in our garden! Relax under the coloured lights in the trees while enjoying classic BBQ treats as well as both boozy and non-alcoholic milkshakes. We’ll also be offering fantastic live music from our open mic which will be running through the whole day. I’ll be a day party you won’t forget and the perfect warm up to the spectacular return of club Katushka the day after! So start off your Valborg celebrations with COLD WAR-BORG at Kalmar! YABADADA DROP YOUR FARTY SANDWICH NOW PONK; KLUBB KATUSHKA CLAIMS THE RETURN OF THE KVALBØRG AT KALMAR NATION WITH SKA’N’SKA! YES PONK; SPUTNIK KOLLEKTIV proudly KABLAAAMS you with LIVE ON STAGE SKA’N’SKA (STHLM) at KALMAR NATION on April 29!! KOMRADOS WE have Been BOORED thru the Cabeza; WE hAVE SUFFERED HARD, NOW FINALLY we HAVE OUR pARTY REVENGE EASTERN STYLE to SOVIETABILLY, BALKANS BREAKS, UKRAINUM, KLESXMER WEDDING METAL and FASTEST SKA in the sweatiest MOSHPIT MAYHAM known to komradkind! Let the freaks of the FIRESHOW rremove your emabarssing eyebrow! MOSHIT ON 2 DANCEflooors, the BEST HARDEST BAND SKA’n’SKA LIVE IN YOUR FACE, SWEAT, (some spit lets be honest), LOVE AND TEARS PONK; THERE IS NO TOMORROW IF WE END THE WORLD 3NIGHT!!!! BRING MOMMA! Välkomna till sillunch på Kalmar nation! Welcome to a traditional herring lunch at Kalmar nation! No Valborg in Uppsala is complete without a traditional herring lunch at Kalmar! Right between the raft races and the donning of the caps Kalmar nation opens its doors to all cold, hungry and thirsting guests, inviting them to a hearty Valborg buffet filled to the brim with Swedish classics. Anyone who wants to find out what a “skagenröra” is, or just stuff themselves full with meatballs and several different kinds of pickled herring will be more than happy with our smorgasbord, which of course offers many vegetarian and vegan alternatives. And in between bites the traditional snaps songs will fill the hall. Simply the most festive lunch during the whole Valborg-weekend! So save yourself the cold, sad outdoor picnics and come eat a hefty lunch and use a proper toilet in the warmth at Kalmar instead! Välkomna till Majmiddag på Kalmar nation! Welcome to Majmiddag at Kalmar nation! 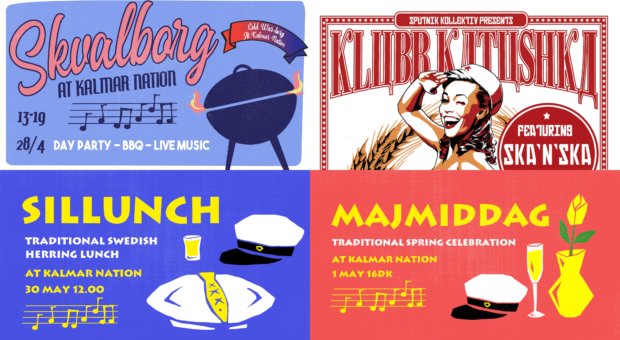 To finish off the wild week of partying that is Valborg in Uppsala Kalmar nation invites all students to the traditional May dinner! This is a dinner where Kalmarites of all ages get together to enjoy a luxorious dinner and to celebrate that spring is finally here. With song and laughter we breathe out the last days of April to then breathe in spring! Come and greet the arrival of spring with us!